From July 26 to 27, Johannesburg, South Africa’s “business capital,” hosted the 10th anniversary BRICS summit that was attended by Russian President Vladimir Putin. Along with taking part in the proceedings, he held numerous meetings with leaders of other countries, including with PRC President Xi Jinping and South African President Cyril Ramaphosa. In the former case, this is explained by the fact that it is actually with China of all the BRICS members that Russia maintains the closest and most versatile ties. This includes for example regular top-level talks. This particular encounter with Xi Jinping was also the longest meeting of all, with the two presidents having their discussion when they informally dined together. What was brought up during the talks was not revealed by the Russian side as the media were not invited to attend. However, presidential aide Yuri Ushakov said before the meeting that it would be dedicated to a discussion on the preparations for Xi Jinping’s participation in the Vladivostok economic forum as well as matters related to bilateral cooperation in all fields. 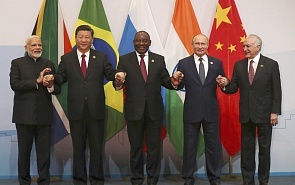 Apart from bridging the conceptual divides across the Global South another important dimension is the sheer physical distance between BRICS members and their counterparts in the developing world. Moreover, Beijing’s involvement in BRICS seems just one of the tools to implement its course for a “community of common destiny for all mankind” and not as the most important tool at that. Let me give you an example: Addressing BRICS Academic Forum’s Peace and Security session in Johannesburg, a Chinese representative talked at length about this course but failed even to mention BRICS. Asked by the present writer about the reason for his “forgetfulness,” he simply avoided answering the question. President Putin also had his first meeting with South African President Cyril Ramaphosa, who was elected in February of this year. There are long-standing historical bonds between Russia and South Africa. South Africans remember the USSR’s comprehensive support in their fight against the apartheid movement, a fight led by the African National Congress, now the ruling party. Regrettably, these relations sustained a lot of damage during the Yeltsin-Kozyrev period in Russia, when the Kremlin chose to receive Frederik Willem de Klerk, the last head of the racist regime, rather than Nelson Mandela, the future president of democratic South Africa. However, bit by bit the relations fell once again into place, particularly when it came to political ties, and the recent presidential visit to South Africa was already the number three. Jacob Zuma, who was elected president in 2009, displayed friendly feelings towards Russia as well. But this active liberation fighter, underground worker and political prisoner, who was largely behind the decision to bring South Africa to BRICS, faced not entirely unfounded charges of corruption in recent years and had to resign after the ANC decided to recall him against the background of parliamentary threats of a vote of non-confidence. Regrettably, the negative attitude towards Zuma was extended to Russia. During the last Zuma period as president, the West-controlled South African media launched a nasty anti-Russia campaign over the signing in 2014 of a framework agreement on strategic cooperation in the nuclear power industry. This is why the meeting between the Russian and South African presidents was particularly valuable marking the birth of a new stage in bilateral relations. The course for all-out cooperation was sealed by the signing of a Joint Statement. The parties also signed an intergovernmental agreement on agricultural cooperation as well as a memorandum of understanding on cooperation in the sphere of water resources. There is no doubt that President Vladimir Putin’s visit to South Africa to attend the BRICS summit, his meeting with President Ramaphosa together with numerous other meetings with Russian representatives’ participation during the year of the South African chairmanship should help South Africans get rid of the misinformation imposed upon them and to better understand Russia’s policy.